I pumped them up and, having not gone flat again after about a day, I figured the bike was good to ride. Sure the back tyre was virtually bald but otherwise good to go! 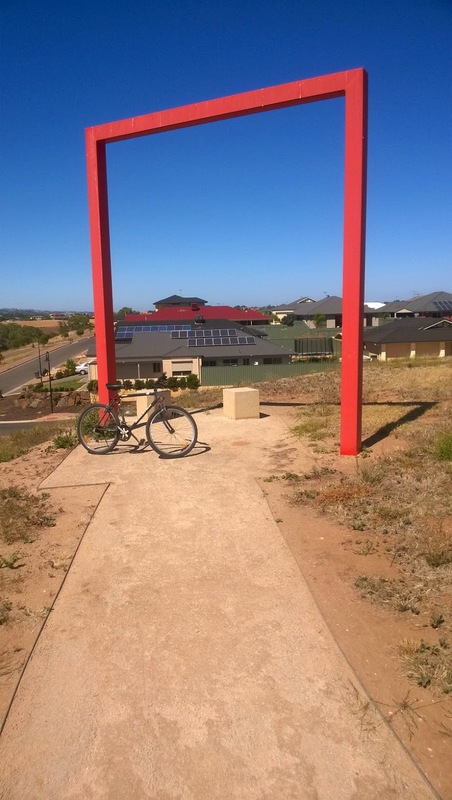 Since we still live right along side Gawler's 8km bicycle trail I made the decision to follow it into the neighbouring suburb of Hewett to see if the Barossa Council had extended it any further than the last time I rode in that direction. Turns out they had extended it quite some distance... maybe even a good 8km in that direction or more. Much of the trail is now road base and gravel, not tarmac, like with Gawler's end, but still a considerable improvement over the vague dirt track that kind of petered out into nowhere previously. 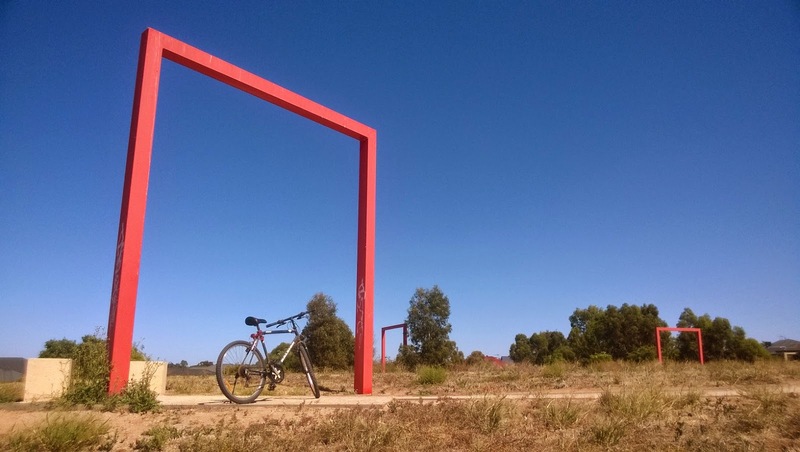 The trail is a very nice ride, winding through parks and bushland with a few steep hill climbs (great if you're riding for the exercise value) a real highlight was the park I discovered on Songlark Grove (that's the name of the adjacent road), Hewett. I did try to find the name of the park but couldn't see any signs and it's not marked on any maps. Basically it's a developed community recreation space for the surrounding housing estate. I might have rode right past except some bright spark had the foresight to erect a bunch of over size rectangular door frames that drew my attention to the spot. You can't see the lush green park from the bike trail, it just looks like you're riding past a giant dirt and scrub land hill. is a lush green park. 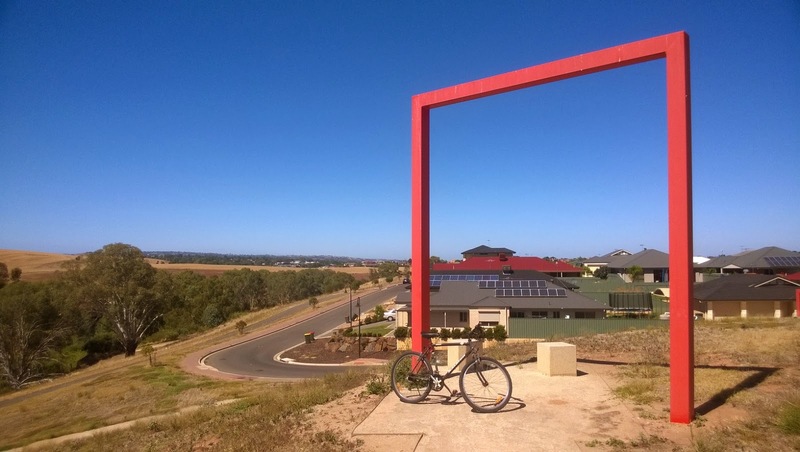 Following the winding trail running through the door frames to the top you're greeted with a stunning 360 degree view of the landscape which includes the valley and bushland through which the North Para River runs and the farmland beyond. If you'd like a better view of the park (and a not so great look at the view) then look up Songlark Grove on Google Maps, go to street view and have a wander around. Photos really don't do these kind of views justice. You really have to be there and experience just how far you can actually see. Good reason enough to get away from whatever tech your head is buried in see how big the world is by comparison. Looks good. Looked at it on Google. Lovely blue sky. Houses look nice. Yes, Hewett is a very new area that's sort of grown over the last 15 years. People think it's part of Gawler because the only thing that separates it is a few signs indicating it's part of the Barossa Council area. I saved the last picture with the biggest view to my computer for my slide show screen saver.